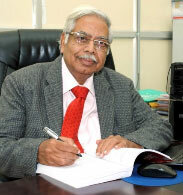 Prof. K. V. Rao is the programme director for petroleum engineering and petrochemical engineering courses. He served Andhra University at various levels till he attained superannuation in 2005. Later, he worked in the University of Petroleum and Energy Studies, Dehra Dun as a Distinguished Professor until July 2010. In his academic career, he taught most of the Chemical Engineering as well as several core subjects in petroleum and natural gas engineering. He is an expert in feasibility studies for petroleum, petrochemical and chemical process plants, safety & energy audits as well as hazop and risk assessment studies.